This event has been postponed to the Fall or next Spring. Stay tuned for future opportunities to engage with CU Boulder Leeds School of Business. When: Thursday, April 19, 11:30 a.m. - 1:00 p.m. 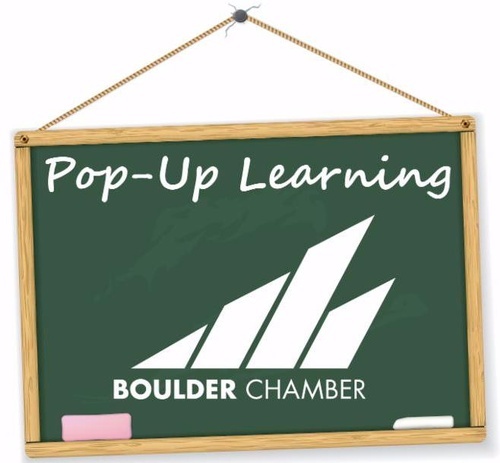 Representatives from Leeds Career Development will be at the Boulder Chamber on April 19th to present information on how you can get involved with Leeds. Topics covered will include: what a good internship looks like / expectations for employers, using Handshake to post opportunities, upcoming events for employers, mentorship, and micro-internships/projects/shadow days. Please register so that we have an accurate attendance count. Enjoy lunch from A Spice of Life Catering! Thursday, April 19, 11:30 a.m. - 1:00 p.m.